OPTIONAL ACCESSORY Mounting Rack: Side view installation. Please order separately. The Peregrine Falcon, an impressive globetrotter. This species of Bird is found almost everywhere around the world: with the exception of a few isolated areas, it breeds across almost the whole of Europe. The Peregrine Falcon (lat. falco peregrinus) is capable of very fast flight, and is noted for the speed which it attains when diving to catch its prey, which can reach 200 kph in short bursts. Like all Birds of Prey the female is much larger and heavier than the male. In Europe this Bird almost became extinct due to the effect all kinds of chemicals in the environment, poaching, the spread of sporting activities and many other factors. Stricter nature conservation measures have aided recovery but it still remains at risk. The breeding habits of these Birds in Europe are both unusual and fascinating. For example, in Central and Southern Europe they are found exclusively on rock faces, cliffs and buildings, while they also breed in trees in Eastern and Northeastern Europe. • the provision of a spacious, protected and securely attached breeding space for these Birds of Prey. • a robust and long-lasting structure that requires little maintenance. The spacious interior offers the Birds plenty of room in which to create a nesting site, and in particular the young have enough space to exercise and develop their flight muscles. 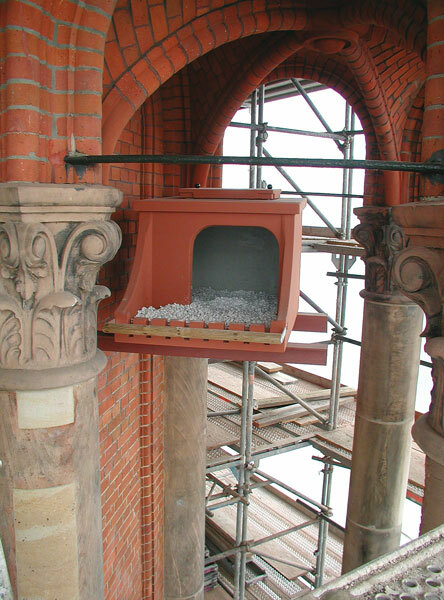 The built-in “balcony” makes it easier for the Birds to leave and return to the box. 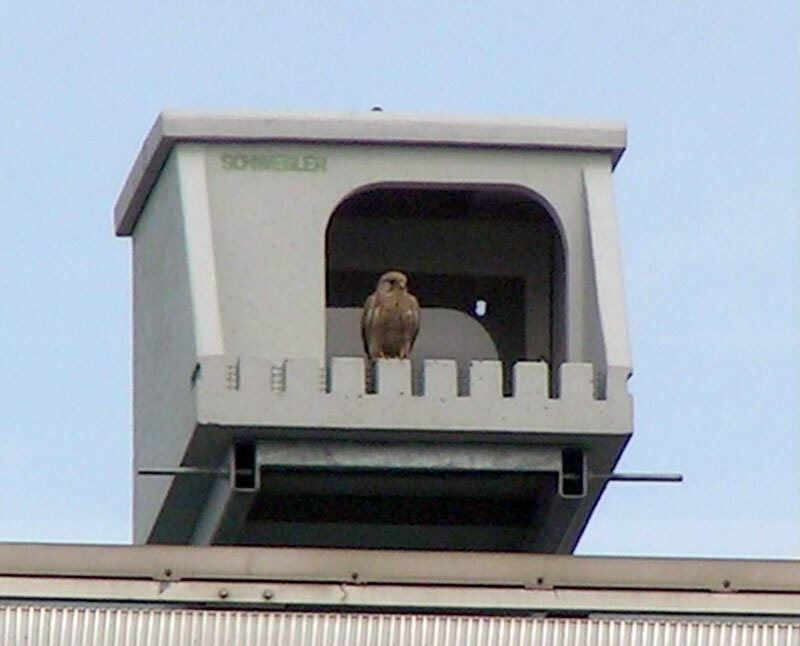 A perch is also included, and this is important because the young Birds are prone to falling out of the nest site. 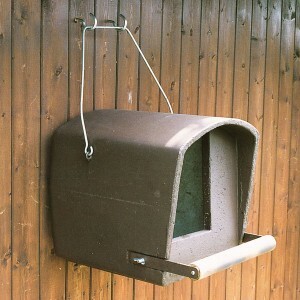 Webcams can be installed inside the box for monitoring or observation purposes. Method of installation / suitable sites: E.g. in quarries or on high ­buildings such as towers, silos, high rise buildings, highway bridges (for example on or around the abutments). Installation height: Generally in heights above 25 – 30 m. North- or east-facing sites have proved to be most effective. The “balcony” with its perch should be placed so that there is a clear area directly below. 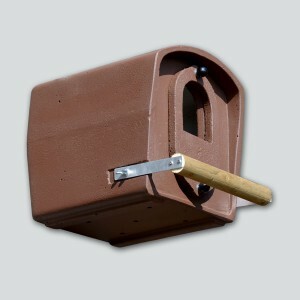 The box can be attached directly to a building using screws (e.g. on flat roof sections) or, by means of a mounting rack and wall plugs, onto an outside wall. Recommended litter/ bedding: Place some gravel or other loose material in the box. 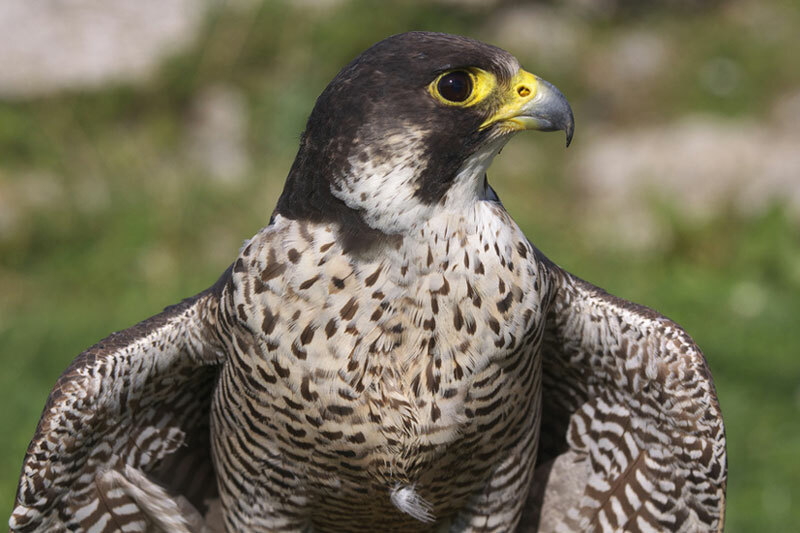 Peregrines do not construct nests, instead the female scrapes a hollow in which to hatch the eggs. The breeding period starts any time between mid-March and the beginning of April. Material: Special, high-strength, reinforced lightweight concrete. This ensures that the box is very long-lasting (decades) and allows a proper and structurally correct manner of installation. The naturally grey, smooth concrete can be painted individually during installation to match the ­building, if required. 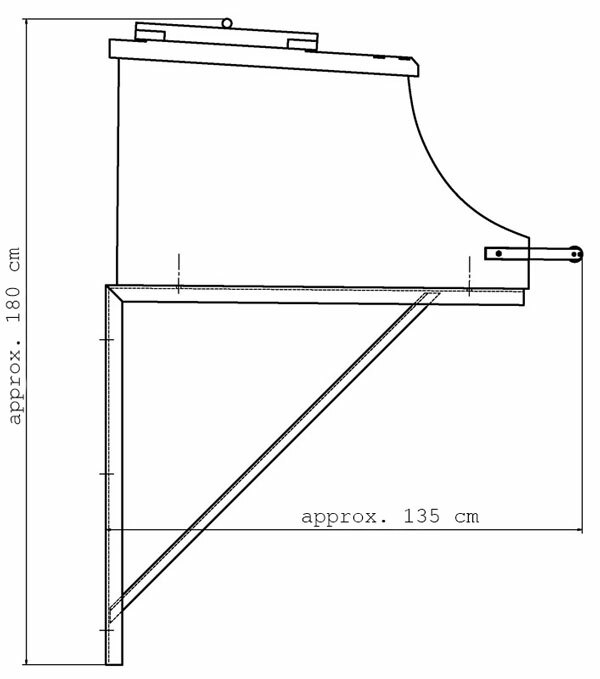 External dimensions: W 80 x H 73 x D 130 cm. 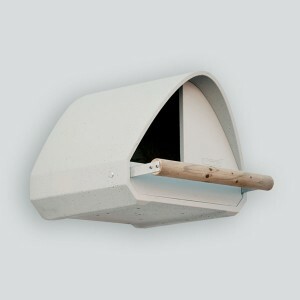 Nesting chamber: W 67 x H 54 x D 72 cm. Weight: approx. 260 kg (empty box). 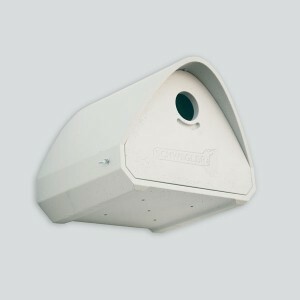 Supplied with: box with integrated drainage holes, removable inspection flap, perch. Installing the box on walls. The fixings between the box and the bracket are supplied. The attachment and fixings between the bracket/wall must be arranged in accordance with the particular site and obtained separately. The bracket is provided with 6 holes on the wall side. Detailed layout and dimensions for planning of installation are available on request. Material: welded and zinc-plated steel construction. 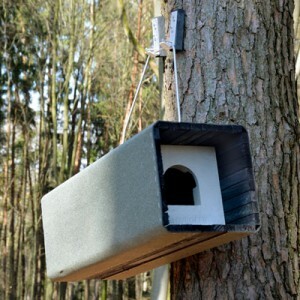 Dimensions: Mounting rack with attached Nest Box approx. W 80 x H 180 x D 135 cm.